SuperFd Catering takes a triple bottom line approach to our business, meaning that we hold ourselves accountable in three regards: socially, environmentally and of course financially; or the three P’s – People, Planet and Profit. Setting more than just financial goals alone gives us a way to value our business in a broader scope. Our company understands that sustainability goes far beyond recycling these days. We have been developing an integrated approach to how we manage and grow our business that enables us to make meaningful strides toward our long-term goals. During the first few years of business, we utilized a shared/community kitchen space at Union Kitchen in order to minimize our footprint. As we grew, we continued to create economic efficiencies that enabled us to focus on sustainable growth. In the process, we have established complementary relationships with local farmers, businesses and waste management companies. At SuperFd, we strive to look at the true cost of the products and practices we use, not just the ticket price. We grasp the importance of limiting the items destined for the landfill through recycling, reusing, upcycling, and composting measures. - Supporting Local Farms and the Local Economy: Sourcing from local and organic farms to provide the highest quality foods to our clients while reducing our carbon footprint. This allows us to directly engage in local commerce and support those producers that share in our sustainable mission. - Composting at Events and Production Kitchen: Product is never wasted. Items such as food scraps, paper goods, and compostable dinnerware and drinkware are taken back to our kitchen for composting through Veterans Compost, LLC. The compost is processed at their facility and used for our portable herb garden. Usable leftover food is donated to DC Central Kitchen. If the product is not usable, then we compost it. - Food Waste and Invasive Species Menus: Designing menus that use the invasive species of the Chesapeake Bay as well as offering a Food Waste Menu that serves to better educate clients about the true nature of food waste. - Eco-Friendly Paper and Plastics: Making conscious decisions in every aspect of our purchasing by choosing natural paper products with minimal chemical processing, compostable plastics made from corn, and post-consumer recycled products at a minimum. 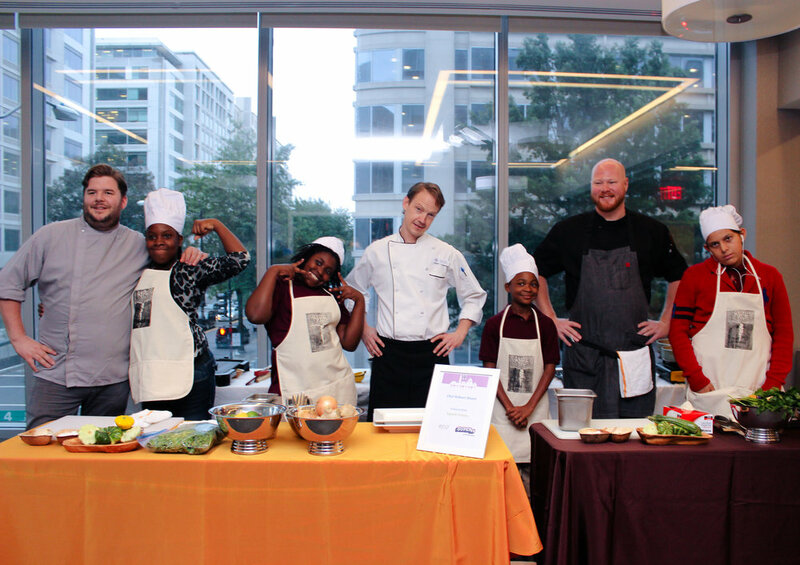 - MicroGreens Project DC: Working with MicroGreens provides us an opportunity to extend our interaction with kids ages 8-10 years old on an individual level. The cooking classes are part of an eight-week curriculum based on the SNAP program spending guidelines and the small class size of ten students provides a lot of personal interaction. We see this contributing to sustainability through shaping better dietary and purchasing habits for the next generation of consumers. - The Washington Nationals Youth Baseball Academy: The Academy provides a forum to cultivate and feed young minds. We are currently assisting them in curriculum development and community outreach. Part of the message and curriculum we preach is always focused on the importance of environmental impact and relating to kids the importance of their actions today on the health of the planet tomorrow. - Recycling at the Office and At Home: Reuse of scrap paper to make a conscious effort in minimizing printed materials as well as recycling of ink and toner cartridges. We also utilize reusable cups, eating utensils, and dinnerware for staff meals. - Focusing on the Fine Details: Identified and remedied a major water usage concern within our own operations. Our team of chefs saw the wasteful practice of using loose, wet ice to keep products cool during transport. We have since implemented a bagged ice system where we make our own smaller vacuum-sealed bags of ice to use in transport without the use of toxic chemicals. These smaller bags enable us to use them interspersed throughout the insulated coolers, giving us the level of cooling needed to keep product at a safe temperature. When our coolers come back to the facility, the ice packs are sanitized and returned to the freezer to be used again on the next trip. This practice has led to a 75% reduction in ice usage. - Upcycling with Storm Oil: Upcycling our kitchen grease into biodiesel in partnership with Storm Oil, Inc.
- DC Central Kitchen: Partnered with DCCK to donate excess food to their Food Recycling program, which is converted into delicious meals to their partner agencies that include homeless shelters, rehabilitation clinics and after-school programs. We will release a cookbook in conjunction with The Washington Capitals & Monumental Sports Foundation benefitting DCCK and all the great work they do in our community. - Kid Power DC: Our work with Kid Power helps replenish our community through engaging youth to cook and grow their own food. We have worked with them on multiple levels. Our Chef sits on their Board of Directors, we sponsor their largest annual fundraising gala and we provide our kitchen as a functional classroom for the kids. Over the summer of 2016, we lead a class of 25 students in a “Pickle Power” project showing them how to utilize proper food preservation methods to extend the life of vegetables.